HUGE List Of Last Minute Bonus Gift Card Deals! 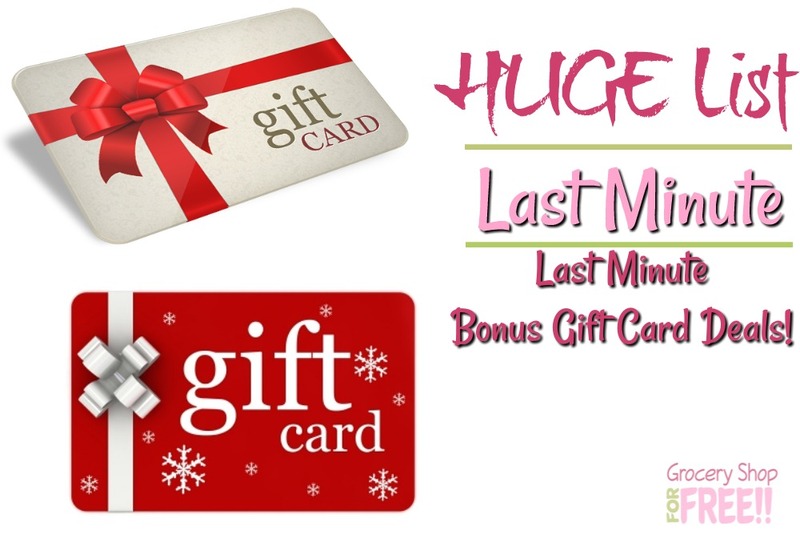 You are here: Home / Great Deals / HUGE List Of Last Minute Bonus Gift Card Deals! Did you forget someone on your list? Well, no worries, we have you covered! From food to retail to entertainment we have gathered a HUGE List of Last Minute Bonus Gift Card Deals! Dunkin’ Donuts: When You Buy $20 in Dunkin’ Donut gift cards online you’ll get a $5 electronic gift card for yourself. Peet’s Coffee & Tea: Get a $5 bonus gift card for every $25 you spend in egift cards. Applebee’s: Get a $10 bonus gift card When You Buy a $50 gift card. Carrabba’s Italian Grill: Get a $10 bonus card when you purchase $50 in gift cards. The Cheesecake Factory: For every $25 purchase on their website, or at any location, you’ll receive a Slice of Joy Card for a FREE slice of cheesecake. Chili’s Bar & Grill: Get a $10 bonus gift card for every $50 you spend on gift cards at Chili’s. Redeemable at Einstein Bros. Bagels and Noah’s New York Bagels. IHOP: Get a $5 coupon with a $25 gift card purchase at participating locations. PF Chang’s: Get a $20 bonus card for every $100 spent on gift cards. Krispy Kreme: Get a $5 bonus card with the purchase of a $25 gift card. The Children’s Place: Get a $10 off $40 coupon with gift card purchases of $40 or more. Regal Cinemas: Get a $10 concession bonus card with the purchase of a $50 bonus pack that includes two $25 gift cards.